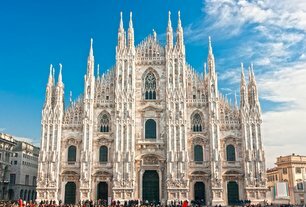 Spring is a wonderful time for Italy Tours and Italy Vacation Packages to Milan, which is a magnificent destination for a trip to Italy at any time of year but truly breathtaking as the days grow longer and warmer. 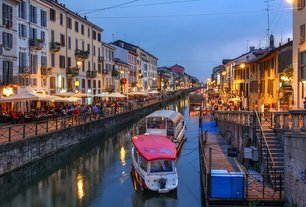 As Italy’s second-largest city and the capital of the Lombardy region, Milan is a powerhouse in global finance and a treasure trove of significant architecture and artwork from over the ages. The city centre is very walkable with excellent public transit (including shared bikes you can rent daily, weekly, or monthly) and a plethora of museums, theatres, galleries, shops, and restaurants with incredible Italian cuisine. Around the globe Milan is known as a leader of haute couture - some feel it is the fashion capital of Europe and others credit Milan for dictating fashion trends worldwide. There is, however, no argument that the Fashion Quadrilateral is where you’ll find the best and brightest clothing designers. Rest assured that Milan is full of eclectic boutiques and shops brimming with fashion finds. International press flock to cover Milan Fashion Week, which happens twice a year with collections on the runway in February/March and September/October. That’s not all! Milan is internationally recognized for design, hosting an annual furniture design exhibition. The celebrated Salon del Mobile 2015 runs April 14-19 this year and showcases the work of hundreds of designers. The weather from the end of April until May is just what you’d expect for spring, with mild temperatures and typically more sun than precipitation. In summer it gets quite hot and fall is cool but comfortable. The best way to get a feel for the history and rich cultural heritage preserved here is to take a Private Walking Tour of Milan. Travelers marvel at the politeness of the Milanese locals, who do not let living in a large metropolitan city excuse them from common courtesy and polite pleasantries. Our exceptionally knowledgeable and entertaining licensed tour guides will take you for an entertaining walk through the city, visiting the key sites such as the Duomo Cathedral, with its Gothic arches and spectacular view from the roof (more than 200 steps up unless you take the elevator! 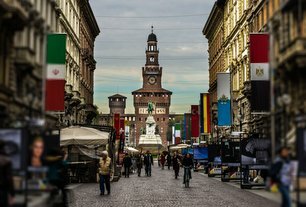 ); the medieval Castle Sforzesco, which houses museums and art galleries; the Galleria Vittorio Emanuele, the oldest shopping mall anywhere and a delight for anyone who appreciates browsing for treasures; and the Scala Opera House, which has offered world-renowned opera and ballet for 200 years. There is also an option to add a visit to see The Last Supper, Leonardo da Vinci’s incredible 15th Century masterpiece mural on the wall of the Convent of Santa Maria della Grazie. Once you’ve taken our private walking tour you’ll feel more confident exploring the city on your own or perhaps even enjoying an excursion into other areas of Northern Italy. Avventure Bellissime offers great flexibility and value with our fully customized Northern Highlights Vacation Package, which lets you determine the itinerary. Possibilities include stops in Verona, Lake Garda, and the unforgettable Dolomite mountains. If you would like to extend your holiday with a cruise, our carefully designed Milan, Lake Como, and Venice Tour lets you see more of Northern Italy before you board a cruise ship in Venice (or add the tour at the end of a cruise docking in Venice). This year Milan is host to World Expo 2015, which means from May 1 to October 31 the city will be even more exciting as it hosts cultural displays from 140 participating countries. This year’s theme is Feeding the Planet: Focus on Life. Sustainability and food will be celebrated through displays exploring sustainability and technology that will contribute to solving world hunger. Are you ready for adventure in marvellous Milan? Contact the Avventure Bellissime team for help planning your next Italy trip, Milan tours, and other exciting excursions.